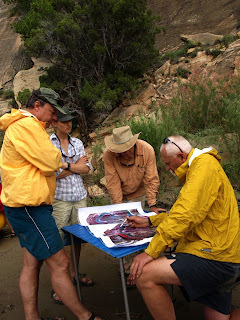 Using maps produced with GIS on the side of the Yampa River to field map geomorphic units and riparian vegetation. Builds proficiency in geoprocessing in GIS to solve spatial problems. Topics include data acquisition, webGIS, georeferncing, vector & raster analyses, surface interpolation, DEM construction, morphometric analysis, modeling, geoprocessing, and error assessment. Students will undertake an independent research project that requires use of advanced GIS, geoprocessing and spatial analytical techniques. Students will present their research at a peer-reviewed poster session and synthesize findings in a mock manuscript for submission to a peer-reviewed journal of their choice. This intensive four week crash course in GIS is intended for graduate students who are new to GIS or to serve as a refresher for those have not used GIS for a while. Students will build proficiency in producing maps in ArcGIS and disseminating interactive maps via Google Earth/Google Maps. Semester(s) Traditionally Offered: Spring. See here for registration information.